I don’t really know why, and it probably don’t even have a reason, but Wink became somewhat trendy nowadays among aidoru acts paying tribute to the long gone 80s aidoru era. Initially, I was planning to write a bigger post about this, commenting every act who payed homage to them this year (well, three acts, but that’s already a good number), but one of them, which is Avex’s doll-like duo FEMM, just recorded an updated cover of “Samishii Nettaigyo” (淋しい熱帯魚), and the other, lovely and trashy aidoru duo Bed In (ベッド・イン), didn’t quite succeed in making a good impression on me with their Wink tribute, “CO.CO.RO Gradation” (CO・CO・RO グラデーション). 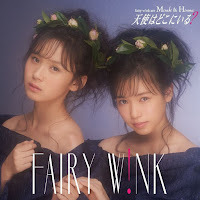 Last but not least, there was fairy w!ink, an HKT48 subunit comprised of Misaki Aramaki (荒巻美咲) and Hirona Unjo (運上弘菜) that ended inspiring me to write about this subject in the first place. 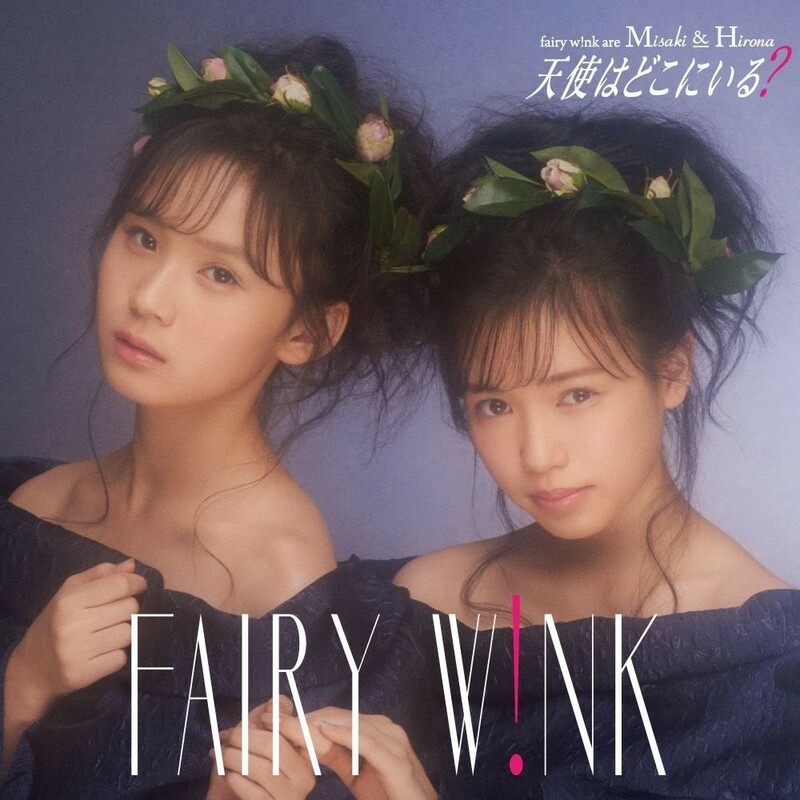 When I was looking for some random stuff, I came across the cover of fairy w!ink’s single “Tenshi wa Doko ni Iru?” and thought I was hallucinating while seeing a Wink single I didn’t know in front of my eyes. Soon I realized it was a tribute done right, but I’d never expect it to come from the AKB48 factory. While I remember they’ve already done something similar with Seiko Matsuda before, I didn’t think Wink was quite as iconic as Seiko-chan. Now I see they are probably iconic enough, since three acts decided to pay tribute to them on the same year. “Tenshi wa Doko ni Iru?”, which was released in December 2017, is a good mashup of Wink and AKB48, both in the visuals and the sonority. We can hear the melodrama that’s typical Wink, with the piano and all the classic European flourishes backed by dance beats, while childish vocals coming from the two HKT48 members just makes the whole thing more tender. As for the visuals, they emulate Wink’s seriousness and porcelain doll-like expressions, but with some cheesy and cheap outfits… which, I think, is something AKB48 and its sister groups could do better at this point (I do realize that they release a video for each song on their singles, but Wink was never that cheap-looking, even if they wore some plastic accessories and over-the-top outfits all the time). Overall, I liked how the melody and arrangement were done in pure Wink fashion, while still sounding somewhat modern (at least for AKB48 and J-Pop’s overall standards nowadays). In the end, I kept thinking about some of Wink’s own songs, like “Kitto Atsui Kuchibiru ~Remain~” (きっと熱いくちびる ～リメイン～) for example – and that’s a great accomplishment since we’re talking about a tribute song –, but also meltia’s “Shirobana no Corsage” (白薔薇のコサージュ). Lyrics were written by Yasushi Akimoto (秋元康), while music was composed by Daisuke Toyama (外山大輔). As for the arrangement, APAZZI was the responsible. Hello! Nice article. I follow AKB48 and the sister groups quite close so I was also glad to see a nod to Wink (the unit name wasn't decided because of the group). Just wanted to add that this wasn't a general release but a special single that resulted from the "Janken Tournament" (rock-paper-scissors) so it probably had less budget than the usual AKB/sister group singles. That is probably why it looks so cheap sometimes. Thanks a lot for you comment and for the information about the "Janken Tournament". About the single, it was probably harsh to say it seems cheap. Personally, I even like the dubious quality, but, at the same time, I always expect something bigger from anything related to AKB48 (they're Japan's biggest female idol group). But it's a sily thing to imagine, since this one is a somewhat gimmicky single... well, they're not going to make something great like "Bukutachi wa Tatakawanai" for this smaller act. The music is still great, though. One more thing: are you from Brazil? I'm asking because I'm Brazilian (born in Rio de Janeiro), and your name is quite common in my country.